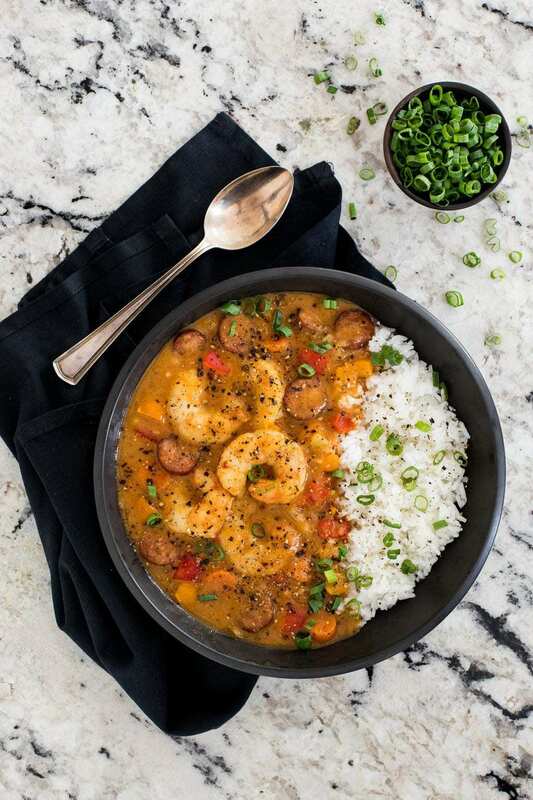 Perfect for entertaining, this Shrimp and Andouille Gumbo is loaded with succulent shrimp, spicy sausage and lots of fresh veggies! This Shrimp and Andouille Gumbo Post is sponsored by Marina Del Rey. I have been compensated for my time. Opinions are my own, as I only partner with brands I truly love. I came up with this Shrimp and Andouille Gumbo recipe back in December, and it was my “go-to” holiday entertaining meal throughout the season. It’s perfect for dinner parties, as it can be made early in the day, and takes only a few minutes to warm before serving. I love meals that can be prepared in advance, giving me time to enjoy guests instead of scurrying around the kitchen. 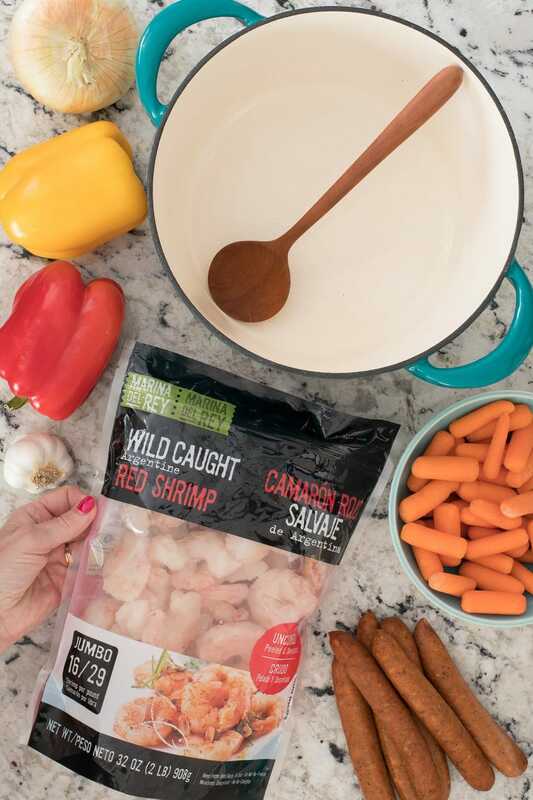 This one-pot meal is super delicious and loaded with succulent shrimp, spicy sausage and lots of fresh, healthy veggies. Each time I’ve served it, there have been lots happy faces around the table! The only kind of gumbo I knew growing up was canned Chicken Gumbo Soup. It wasn’t a favorite of mine, so when I left home and began cooking, gumbo wasn’t even on my radar. That all changed when a friend brought a pot of gumbo to share at work one day. She had learned to make this famous Creole dish at a cooking school in New Orleans. One taste had me smitten, and I begged for the recipe. That was many years ago and I’ve been making gumbo variations ever since. It’s one of Scott’s all-time favorite meals and always brings me a beaucoup of accolades when I present him with a bowl. He describes it as “candy” which translated means; Out-of-this-world delicious! I changed things up a bit for this Shrimp and Andouille Gumbo. In the past, when I’ve made gumbo, I included chicken as well as shrimp and andouille. 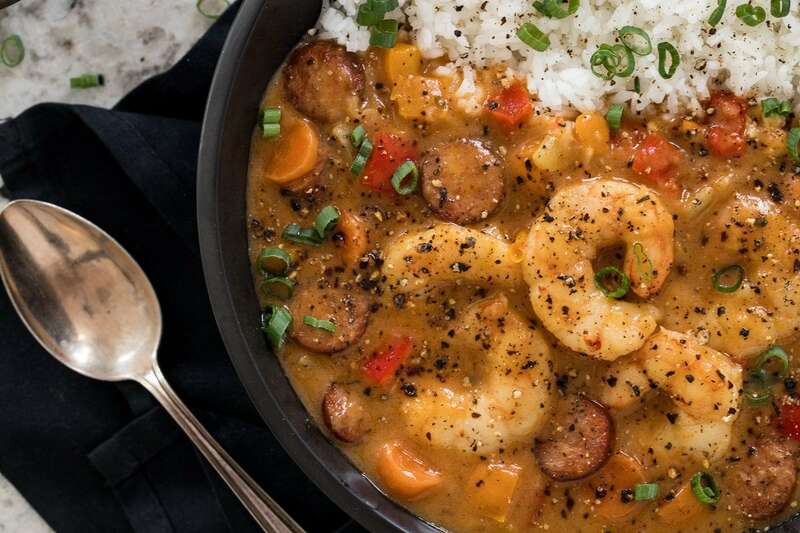 But since shrimp is one of my favorite parts of gumbo, I decided to go with just shrimp and andouille sausage for a delicious, but healthy splurge. I used Marina Del Rey Wild Argentinian Shrimp in this gumbo with fantastic results. I discovered Marina Del Rey’s frozen shrimp last summer while shopping at Sam’s Club. I love shrimp that can be purchased already peeled and deveined, as it makes cooking with shrimp a breeze! The shrimp are easily thawed overnight in the refrigerator or, for a quick thaw, simply rinse them with cold water and drain in a strainer. Marina Del Rey shrimp are not only convenient, they’re large, sweet and super delicious. They’re also free of antibiotics and growth hormones, high in protein and Omega-3 fats and have lower sodium levels than most frozen shrimp. And I love that Marina Del Rey shrimp have no added water or chemicals. Another changeup I made in the recipe was to include a half pound of sliced carrots. Carrots are not a norm in most gumbo recipes, but I love to sneak extra veggies into our meals whenever I can to make them healthier. The carrots become meltingly tender and also add a touch of pretty color along with the red and yellow bell peppers. You’re probably familiar with this popular Louisiana dish, but may not be aware of exactly what it is or where it came from. Gumbo has a zillion variations, but at its base, it’s a savory Creole-style stew that’s made from meats, shellfish and an array of vegetables, spices and herbs. It actually originated in West Africa and took root in the southern U.S. colonies in the late 1700’s. In addition to Marina Del Rey shrimp, I also use bell peppers, carrots, onions, garlic, spices and andouille chicken sausage. Andouille is a somewhat spicy sausage that’s often used in Cajun cooking. It’s traditionally made with pork, but chicken andouille is now available. I really like it – the same flavor, but it’s lower in fat and calories. Andouille is sold at most larger grocery stores. The one thing gumbos have in common is a roux. A roux is simply a mixture of oil (or butter) and flour that’s cooked together and used to thicken sauces, soups and gravies. In contrast to French sauces, where a roux is often used but kept very light in color, gumbo roux is meant to reach a deep golden (even darker sometimes) hue. In culinary circles, a roux is classified in terms like “blond”, “peanut-butter”, “brown” or “chocolate”, depending on its color. The darker the color, the richer and more “nuttier” the flavor will be. You can see exactly how to make a roux in this Shrimp and Andouille Gumbo video below. For this Shrimp and Andouille Gumbo, I like to go for the “peanut butter” (or slightly darker) color. It makes for a very flavorful sauce, while still allowing the delicious flavor of the shrimp to shine. It only takes about 10 minutes for the roux to reach the perfect color. Once the roux is made, the rest is super simple! Are you ready to make a fabulous meal for family and/or friends? 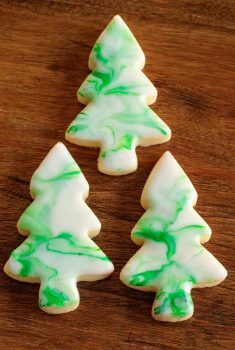 Check out the recipe and make your shopping list! If you have a Sam’s Club membership, be sure to pick up some Marina Del Rey. 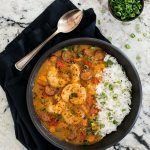 I think you’ll love this Shrimp and Andouille Gumbo; it just may become your “go to” meal for entertaining too! This gumbo can be made early in the day or even a day in advance. Don’t add the shrimp right away though. Just prep through step 5. Then bring the gumbo back to a simmer right before dinner, add the shrimp and cover for 10 minutes. This will ensure that your gumbo will taste like it was just made! 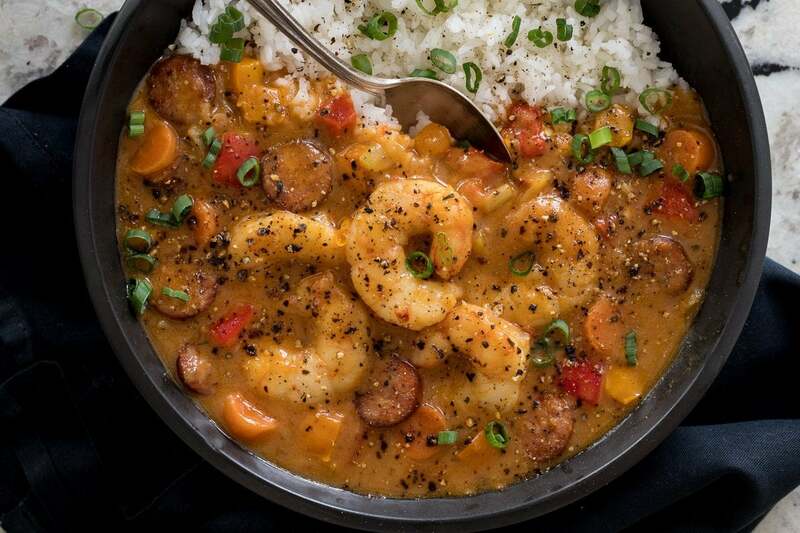 I like to serve this Shrimp and Andouille Gumbo in bowls with jasmine or basmati rice. I add a simple green salad dressed with this Orange Cilantro Vinaigrette. The flavors pair really nicely! I used andouille chicken sausage for this gumbo as a healthier option. You could also use traditional andouille sausage made with pork. This recipe calls for Cajun seasoning. Cajun seasonings can vary in spiciness and amount of salt. The Cajun seasoning is tossed with the shrimp which are added at the very end. You can always add more salt and/or Cajun seasoning, but wait until the shrimp has been added to the gumbo. 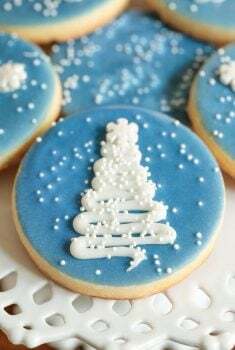 Then give it a test and season to your individual taste. Toss shrimp with Cajun seasoning, cover with plastic wrap and refrigerate. Heat oil in a large heavy-duty Dutch oven over medium heat. Add sausage and cook for 6-8 minutes or until sausage is nicely browned. Remove with a slotted spoon and set aside. Add flour to oil and cook over medium-low heat, stirring frequently, until mixture turns a deep golden brown color, slightly darker than the color of peanut butter. This will take about 10 minutes. If the mixture is darkening too quickly, reduce heat. Add onions, peppers and garlic. Cook, stirring occasionally for 8-10 minutes until onions begin to soften. Add the chicken stock, carrots, spices and pepper. Stir well. Bring to a boil, then reduce to a slow simmer. Cook for 25-30 minutes, uncovered until carrots are very tender. Add shrimp and reserved andouille sausage, stir to combine, then return gumbo to a boil. Cover pot and turn off the heat. Let gumbo sit, covered for 10 minutes before serving. The shrimp will cook perfectly during this 10 minute resting time. Taste and season, if needed. Serve in bowls with basmati rice. Garnish with sliced green (spring) onions. 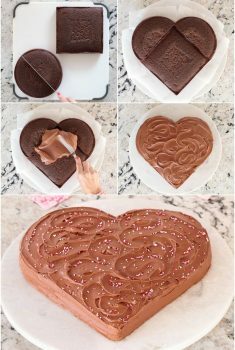 See Café Tips for more detailed instructions and tips. Chris, I never have been a gumbo fan because I don’t like spicy foods, but my husband does and I just had to give this a try. Well I tried some as well and although it was a bit on the spicy side, I did like it with the rice added to it. I have one question, though. With leftover shrimp, it usually gets tough when reheating, and I did put a whole bag of shrimp in the recipe. How, if possible, do you reheat the gumbo without making the shrimp tough? Hi Norma, I’m so happy you enjoyed it! I usually just serve the leftovers warmed in the microwave. I don’t use full power but rather set the level at 4 or 5 to gently reheat it. It can also be reheated on the stovetop over low heat. Just enough to thoroughly warm it through but not to boil. That’s when the shrimp will get tough. Yummy! I made this Chris, and as a self-proclaimed worst cook in Canada, I loved my Gumbo! I learned what a roux is & why its important. I trusted you with dropping the shrimp in at the end, and the cook is perfection! I couldn’t get my hands on Andouille sausage, and with determination I approached 4 butchers in my local market. I came close, but settled with a chorizo sausage that was delish! Thanks so much Erin, for taking the time to share your results. I think you just changed your reputation, it sounds like you did a wonderful job. And I think chorizo would be a good substitute! Your gumbo looks great…perfect when entertaining a crowd. I usually make gumbo 2-3 times a year and I always freeze some. Everyone but our youngest daughter and I love shrimp and crab in our gumbo. Thank you for the recipe and the video. I can’t wait to make this! Looks incredible and so tasty! Hope you enjoy it, Michelle! I just made this dish for supper tonight and it was delicious. We loved the gumbo on this cool evening. It is filling, has rich flavor and has bonus veggies! My husband and I agree that this is a keeper! We love your recipes, Chris! Thank you so much, Lisa! I’m so happy you enjoyed it! To mitigate the spiciness, I like using Old Bay. I find it less spicy than Creole seasoning. For the veggies, I use the traditional “trinity” of celery, onion and green bell pepper, plus frozen okra at the very end. Will try adding carrots next time– I am intrigued! This Gumbo looks divine! I would also prefer to serve it with rice. So rich and comforting! 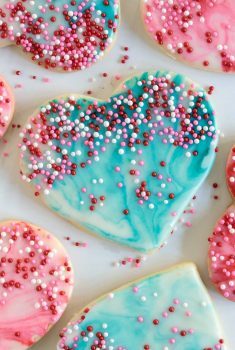 I adore this recipe! It’s seriously the perfect combination of flavors. And I love that you’ve used Marina del Rey shrimp. I love them! Canned gumbo is what I was exposed to when I was younger so I had no idea how great the real thing is! I love classical elegant dishes like this that are quick to put together but still wow the crowd. This is perfect for Marina del Rey Shrimp (my favorite!) and your photos are just beautiful Chris! I fell in love with gumbo on our first trip to NOLA when the kids were babies. 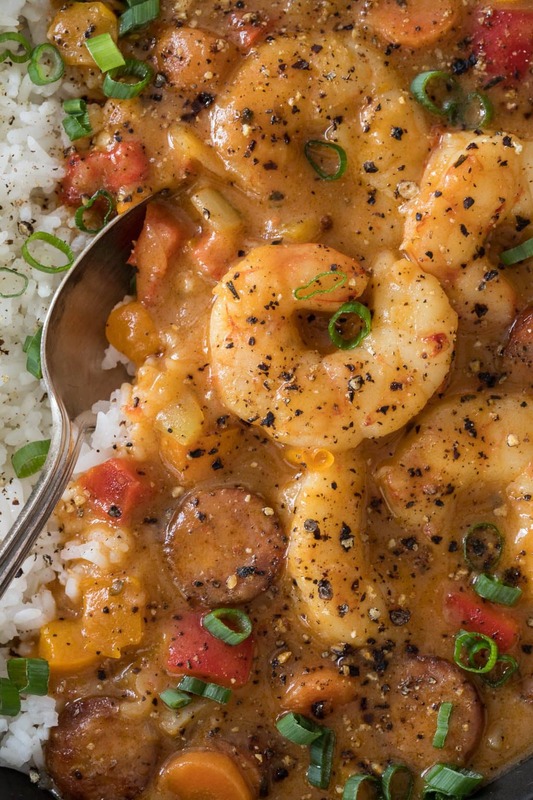 I need to make it more often—and a shrimp and sausage version sounds wonderful! Thanks, Liz! Sounds like you’re a long time gumbo lover too! A total comfort food classic! I’d love to sit down with a piping hot bowl right now! Love how plump and perfect the shrimp are! Thanks, Jenn! Wish we could enjoy a bowl together! I’ll have to see if our Costco here sells that shrimp! I’m always try to buy wild caught shrimp. I’ve never made a gumbo and will have to remedy that soon! Gumbo is one of my husband’s favorites Chris! This looks fabulous! I’ll definitely need to treat him to this! Such an amazing dish! It looks like pure comfort to me. Thank you also for teaching me more about roux. What a perfect meal! Have never made or had gumbo…love those juicy shrimps. Looks amazing Chris. I want to try it next time my family comes to visit. How many adults would this serve? Hi Joni, this dish will easily feed 8-10 adults. This is absolutely on my to do list!! Looks SO comforting! I’ve only had okra Gumbo before and this beats it a million times! Now we know what brand of shrimp to buy, too! I love the way you have this plated, half on each side. It looks like it took hours to make! I’m so hungry right now, Chris, and I wish you were my neighbour! I will make this beautiful recipe because I always have lots of Marina del Rey shrimp in my freezer, lol. Perfectly delicious and loved your tips! We would have a wonderful time being neighbors Robyn! I bet we wouldn’t get much done though as we’d be too busy talking about food! Thanks, Sue – I love that the shrimp are so large and make such a pretty presentation! I love all the spiciness you have going on here – with the sausage and our favorite Marina del Rey shrimp! What a hearty bowl of deliciousness perfect for these gray, rainy days of winter. Sharing!